Summer continues wet and windy and cold. The Met Office says there have only been eight calm days this year – defined as ‘the number of days each year, for the UK overall, where at least 20 weather stations have recorded a maximum gust speed of 10 Knots (11 mph) or less’ – and none of those days were in May, June or July. Certainly in the Cairngorms wind and rain and low cloud have seemed the norm for many weeks. Sometimes though conditions like this can give tremendous skies with swirling mists and towering clouds and a landscape that fades and sharpens in the changing air. On such a day I wandered into Coire an Lochain and then along the rim of the Northern Corries over Cairn Lochan and Stob Coire an-t Sneachda. Fierce squalls brought sharp icy rain on a bitter wind. This was not a day to linger but one to stride out invigorated by the stormy weather. 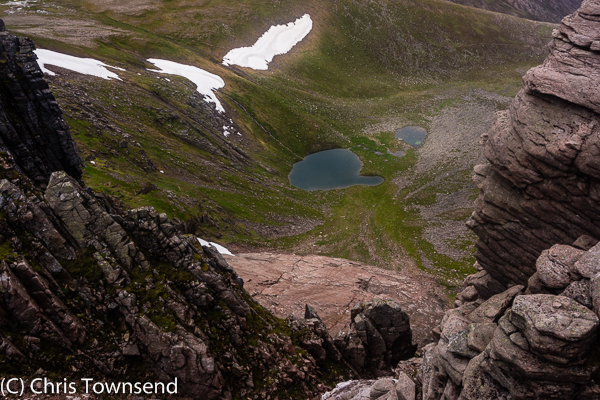 Many large snow patches still decorated the walls of Coire an Lochain, unusual in late July. One lay across the path that angles up the west side of the corrie. The snow was hard and icy and steep. Without ice axe or crampons I skirted below it then climbed up a moss-filled stream tumbling down beside the old dirty snow. Better wet feet than a slide onto boulders. A party descending worked their way along the upper edge of the snowfield, slipping and sliding on wet rocks and sodden moss. 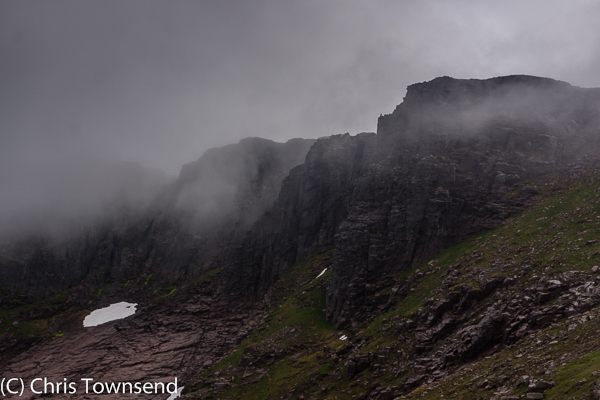 On Cairn Lochan the ragged mist tore through the cliffs and spread in waves across the summit. Views came and went as I followed the corrie edge. Distant hills suddenly appeared then abruptly vanished. At times I could see only a few yards, at others many miles. Gazing down a gully I followed the smooth bronze line of the Great Slab to the lochans that give the corrie below its name. 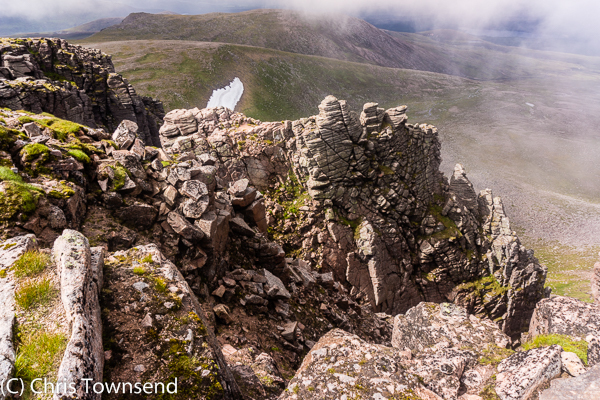 Descending via the Fiacaill a’Choire Chais I was enveloped in the densest mist of the day, blotting out all views. Then as the Coire Cas car park abruptly appeared not far below the sun briefly burst through and the clouds fled to the summits. By the time I reached the car it was raining again.